A huge hand just played out here in the latter stages of the evening, one that resulted in Kevin Schulz vaulting to the top of the chip counts. Action exploded on a flop between Schulz and his unknown opponent. A series of raises resulted in Schulz moving all in to put the pressure on his opponent, who had already invested 45,000 in the pot. He had another 50,000 or so behind, and after nearly five minutes in the tank, he said, "I call." Schulz then tabled the for a set of deuces, which pulled out in front of his opponent's . Neither the turn nor river was a dreaded lady and Schulz is primed to finish as the Day 2 chip leader. 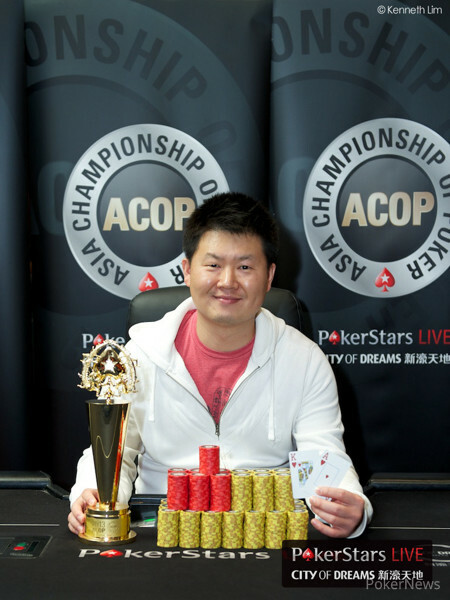 Congratulations to Sunny Jung, Winner of the ACOP HK$100,000 Main Event (HK$4,352,000)! Devan Tang Eliminated in 2nd Place (HK$3,667,000); Sunny Jung Wins!